Veteran actor Charles Dance, better known as Game of Thrones hardcase Tywin Lannister, is taking on a very big role in The Witcher 3. Charles Dance has been acting for nearly 40 years but if you recognize his name, the great likelihood is that it's due to his recent portrayal of Tywin Lannister in Game of Thrones. But he'll soon also be known to gamers as the man behind a different and yet not entirely dissimilar character: Nilfgaardian Emperor Emhyr var Emreis. This next bit is a little spoiler-ish for those who haven't yet played The Witcher 2: Assassins of Kings, so consider yourself warned if you don't want to know how it wraps up: with the massed forces of Nilfgaard pouring over the border into the Northern Kingdoms. That puts Emhyr at least potentially front and center in The Witcher 3. 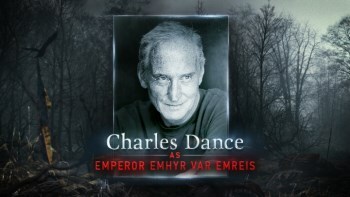 "Charles Dance is the perfect candidate to play the mighty Nilfgaardian emperor in our upcoming title," lead writer Marcin Blacha said. "It's a dream come true for the team here at RED to be able to work with such an accomplished actor and magnetic personality." Voice acting is a different sort of gig than "conventional" television or film acting but Dance's performance as Tywin Lannister (which you can catch a bit of on YouTube if you're not familiar with it) certainly makes him seem like an ideal choice to play the Emperor: Not necessarily evil, but ruthless, pragmatic and utterly determined to do anything necessary to achieve his goals. I'm really looking forward to seeing what he brings to the table. The Witcher 3: Wild Hunt is expected to come out sometime in 2014 for the PC, Xbox One and PlayStation 4.